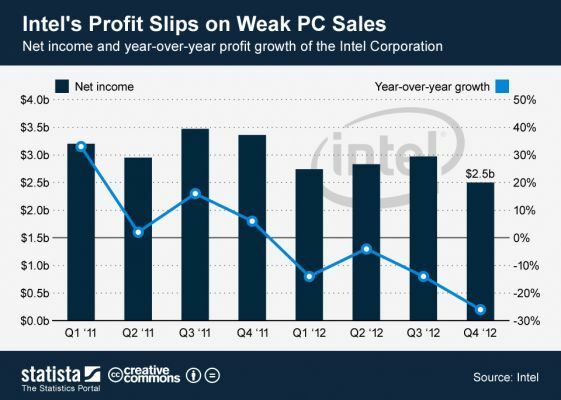 Intel earnings have just been published for the last quarter, and they are not looking too good. Their profit declined. The worst part about it is that it will continue to decline, because Intel faces some major challenges that can’t be so easily fixed, and the market might not wait around for Intel to fix them. By far the biggest challenge Intel is going to face both in the near term and the long term is to compete with ARM processors on price. In the PC market, they’ve been fine with higher prices than AMD, because they weren’t that much more expensive, and many people liked the brand, and wanted that extra horsepower. So it was fine to pay extra dollars for it. But things are very different when put against ARM. ARM chips are usually an order of magnitude cheaper than most of Intel’s chips. High-end ARM chips typically sell for $20-$30, while Intel Core chips usually sell for $200-$300. H0w can Intel even hope to compete with ARM then, when the devices of the future (tablets, smartphones, etc) will have “powerful enough” ARM chips (or $400 vs $700, if everything else is equal)? Virtually nobody will buy a $500 devices with Intel processors, instead of the $200 ARM-based devices with the latest and most high-end ARM chips (that will be much more powerful than they are today). That difference in price will not make sense for most consumers. You could say, Intel will be using Atom chips to compete with ARM at every level. Assuming Intel Atom will be competitive enough (they are still severely underpowered in the GPU department, and also don’t seem to keep up with the latest ARM CPU’s in performance), they are still not competitive enough in price. They typically cost OEM’s about twice as much as a high-end ARM chip. Especially in the Android market, it doesn’t even make sense for an OEM to consider Intel. Why would they buy a chip that costs twice as much and has the same (at most) or less performance? Unless Intel offers them some discount on Intel Core chips for PC’s, then I’m not seeing too many OEM’s thinking it makes sense to choose Intel Atom over ARM, when they already have all the drivers they need for ARM, and it’s the industry standard. But even if Intel Atom is phenomenally successful, that doesn’t necessarily mean it’s good news for Intel, and this is where Intel’s biggest problem lies. Intel makes very little profit on Atom, especially if they have to cut down on its cost to be more competitive with ARM in the future. As a company, Intel is built for selling high margin chips. It’s actually the reason why they failed with the StrongARM division, that they later sold. They couldn’t adapt as a company to sell those low margin chips. I’m skeptical they are going to be able to adapt on time right now, especially with a new change in leadership at Intel soon. It seems, though, that the new Intel CEO will be chosen from a list of current executives, and they won’t be bringing someone with a fresh thinking in the company. The problem with this is that Intel needs to become a much leaner company, if it wants to be competitive in the next 5 years and beyond. They are going to have to lay off a lot of people, pay the remaining ones less, stop all sorts of experimental and expensive projects, and so on. They need to bring the company to a level where it can be profitable selling only $20-$30 chips, and not too many of them, because it’s highly unlikely Intel will ever beat Qualcomm in the mobile space, or even Nvidia for that matter. They will most likely remain a relatively small player, so they need to adapt the company for the kind of revenue and profit such a company would make. This sort of cost cutting for Intel is an absolute must. They can either do it now, when they are still making a lot of money and profit, and could use the money to turn things around, or they can do it later when their profit and revenue has greatly diminished due to the decline, and a turnaround is much more painful and harder. Either way it’s going to happen. It’s best for Intel to have control of the situation, instead of letting it spin out of control. Intel’s “Core” chips don’t sell for $200 – $300 on average. ASPs are more like $100 across the entire PC mix. Don’t be ignorant.